David Whyte (born 2 November 1955) is an English poet. He is quoted as saying that all of his poetry and philosophy is based on "the conversational nature of reality". His book The Heart Aroused: Poetry and the Preservation of the Soul in Corporate America (1994) topped the best-seller charts in the United States. Whyte's mother was from Waterford, Ireland, and his father was a Yorkshireman. He attributes his poetic interest to both the songs and poetry  of his mother's Irish heritage and to the landscape of West Yorkshire. He grew up in West Yorkshire and has commented that he had "a Wordsworthian childhood", in the fields, woods and on the moors. Whyte has a degree in marine zoology from Bangor University. During his twenties Whyte worked as a naturalist and lived in the Galapagos Islands, where he experienced a near drowning on the southern shore of Hood Island. He led anthropological and natural history expeditions in the Andes, the Amazon and the Himalayas. From "Revelation Must Be Terrible"
Whyte moved to the United States in 1981 and began a career as a poet and speaker in 1986. From 1987 he began taking his poetry and philosophy to larger audiences including consulting and lecturing on organisational leadership models in the US and UK exploring the role of creativity in business. He has worked with companies such as Boeing, AT&T NASA, Toyota, The Royal Air Force and the Arthur Andersen accountancy group. Work and vocation and "Conversational Leadership" is the subject of several of Whyte's prose books, including Crossing the Unknown Sea: Work as Pilgrimage of Identity, The Three Marriages: Reimagining Work, Self and Relationship and The Heart Aroused: Poetry and the Preservation of The Soul in Corporate America which topped the business best seller lists, selling 155,000 copies. Whyte has written seven volumes of poetry and four books of prose. Pilgrim is based on the human need to travel, "From here to there.' The House of Belonging looks at the same human need for home. He describes his collection Everything Is Waiting For You (2003) as arising from the grief at the loss of his mother. Pilgrim was published in May 2012. His latest book is Consolations: The Solace, Nourishment and Underlying Meaning of Everyday Words, an attempt to 'rehabilitate' many everyday words we often use only in pejorative or unimaginative ways. He has also written for newspapers including The Huffington Post and The Observer. He leads group poetry and walking journeys regularly in Ireland, England and Italy. He has an honorary degree from Neumann College, Pennsylvania, and from Royal Roads University, British Columbia, and is Associate Fellow of both Templeton College, Oxford, and the Saïd Business School, Oxford. 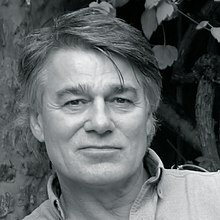 Whyte runs the Many Rivers organisation and Invitas: The Institute for Conversational Leadership, which he founded in 2014. He has lived in Seattle and on Whidbey Island and currently lives in Langley, in the US Pacific North West and holds dual US-British citizenship. He is married to Gayle Karen Young, former Chief Talent and Culture Officer of the Wikimedia Foundation. He has one son, Brendan, from his first marriage to Autumn Preble, and a daughter, Charlotte from his second marriage to Leslie Cotter. Whyte has practised Zen and was a regular rock climber. He was a close friend of the Irish poet John O'Donohue. Solace: The Art of Asking the Beautiful Question"
^ Whyte, David (2007). River Flow (1st ed.). Langley: Many Rivers. ^ Whyte, David (2001). Crossing the Unknown Sea (1st ed.). Riverhead. ^ a b The Independent "Business types everywhere would benefit by listening to a chap with a Ted Hughes accent and a David Lodge haircut declaiming poetry " 1 July 1995 . ^ Whyte, David (2012). Pilgrim: Poems by David Whyte (1st ed.). Langley: Many Rivers Press. ^ Whyte, David (1997). The House of Belonging. Langley: Many Rivers. ^ Whyte, David (January 2015). Consolations: The Solace, nourishment and Underlying Meaning of Everyday Words (1st ed.). Langley: Many Rivers Press. ^ "Gayle Karen Young: Supporting Wikimedia's dynamic culture – Wikimedia Blog". blog.wikimedia.org. Retrieved 2017-12-31. This page was last edited on 18 February 2019, at 22:43 (UTC).